Similar to any other destinations in Malaysia, there are some must try local specialties available only in Cameron Highlands. With a diverse range of local specialties and international cuisines available here, looking for a meal around Cameron Highlands is an easy task. You can pick from unique Malay dishes to authentic Chinese cuisines, or perhaps spicy Indian delights and mouth-watery Western selection. Bringing you the best, scrumptious and also mouth watery local and international cuisines, holidaymakers can choose from a wide range of restaurants suggested below. Holidaymakers and tourists would not find a shortage of good food from various restaurants available in the Highlands. But how do spot the best restaurant that serves a fine selection of cuisines? Spot a restaurant with a crowd and good food is awaiting you there! One of the best choices if you are around Cameron is steamboat. When the sun goes down and the cool mountain becomes chilly, it is time to head to steamboat restaurants. Steamboat (also known as hot pot) is a pot of boiling chicken soup heated by gas fire stove. Some of the restaurants served two soups in a pot – fiery chili broth and chicken soup. Other than that, diners can also ask for spicy tom yum soup or herbal soup. Diners are free to pick from a wide choice of food available such as raw chicken meat, thinly sliced beef, vegetables, mushroom, fishballs, tofu, noodles and seafood and placed the ingredients into the simmering metal pot of soup. Using the ladles provided by the restaurant, diners must scoop the cooked ingredient from the pot and eat it with special dipping sauce. Nothing beats hot simmering charcoal steamboat in Cameron Highlands. Well, of course having a steamboat meal is nothing new but have you ever try charcoal steamboat where the soup would continue to boil because unlike the gas stoves type where you can adjust the fire, there is no way to stop the soup in charcoal steamboat to boil except to wait for the charcoal burnt out. Charcoal steamboat is slightly different from the usual type because it adds aroma to the simmering soup. Take your pick from raw chicken to fish, vegetables and tofu, seafood such as prawns as well as fish balls, crabsticks and noodles to put into the soup and let it boil. Just cover the pot and in no time, use the ladles to scoop the soup and vegetables. Diners can always ask the waiter to add more soup after boiling countless times. Restaurants along the main road of Brinchang town like Kwan Kee, Silverstar, You Hoo and OK Tuck serve the best charcoal steamboat as well as a wide array of Chinese cuisines. Price starts from RM28 per person. Using charcoal for steamboat was quite popular in the 80s when gas was still expensive but it is known to be tastier and more delicious. If you are going for the charcoal steamboat, make sure that you take the clear soup instead of the spicy one. During weekends and public holidays, the steamboat restaurants are very crowded and packed. To avoid disappointment, make an advance booking by calling in or order online beforehand. Besides that, parking might be quite limited in the surroundings of Brinchang and Tanah Rata, so you might need to find your way around. Charcoal Steamboat in Strawberry Park Hotel – The hot and tasty soup in the short funnel is perfect especially during the cold nights in Highlands. The ingredients offered are mainly the usual food which is also available in other restaurants such as fish ball, meat balls, crab sticks, prawn, tofu and many more. But all in all, dining in these particular restaurant will definitely please you as the outdoor garden terrace is wonderful and spectacular during night time. First and foremost, you may check out the cozy and spacious The Lord situated above the Marry Brown fast food restaurant. Strategically situated opposite the Freesia Bus Terminal in town of Tanah Rata, the café offers good food even though the decorations and restaurant design is rather dull and simple. Food selection varies from the delicious Western cuisines to exotic local delicacies. The Lord is most famously known for serving the best desserts. In addition to that, The Lord also serves scones, pancakes, English tea and fresh juicy apple pies. The best of all, the food are all reasonably priced. Next up, head to Restaurant No. 14 situated along the main street of Tanah Rata town. In fact, the restaurant name is rather odd but considering the fact that the name was derived directly from the shop lot number it resides, the name makes sense. Serving you the exotic Southern varieties, the restaurant also offers delicious side orders such as Fried Chicken and also lighter snacks such as roti canai, chappati or even Fried Bihun. If you happen to drop by in this restaurant, remember to try out the famous pulled tea or commonly known as teh tarik. Other drink worth trying is the signature mango juice. Uncle Chow Kopitiam is definitely your next stop. Walk along the street from the Cameronian Inn before you reach the corner of the building. The restaurant is furnished with tungsten lighting and offers a cozy interior for patrons. The dishes served are mainly home cooked Nyonya style cuisines such as assam laksa, prawn mee and curry laksa. For those who would like to try the local toasted bread with kaya complete with fresh brewed coffee, do not miss out when you are in the kopitiam. The next stop, Smokehouse Hotel and Restaurant serves the best English tea and freshly baked scones. Other scrumptious cuisines served are Chicken A la King and Devilled Chicken. Enjoy a sip of English tea with the cozy English feeling as this country house is the best spot for you to enjoy a panoramic and picturesque view of lush greenery with a cup of tea. Vegetarian do not have to worry as Highlands also offers a Cameron Organic Produce Restaurant whereby the steamboat restaurant offers fresh local produce organic vegetables free from pesticides and artificial fertilizers. The restaurant uses charcoal for heating and thus, it adds to the soup aroma. Priced at RM22 for an individual with at least two persons as the requirement, this organic vegetable steamboat is served without salt which is suitable for health-conscious holidaymakers. If you are looking for some delicious Indian cuisines, try the aromatic Banana Leaf Rice. The plain white rice is served with a variety of vegetables and crunchy papadams on banana leaf. For those who are craving for some tender and savoury meat, you can also pick from the variety choices offered such as curry chicken, beef, mutton and fish. Other than that, diners should also order tandoori chicken, naan and roti canai. These are some of the local favourites available 24/7. Stalls along Jalan Besar serve some of the best Malay cuisines in Cameron Highlands. Remember to try nasi lemak and satay. Nasi Lemak packed in pyramid-shaped is served with anchovies, fried peanuts, gravy (sambal) and curry. You can add a variety of meat such as squid or rendang chicken to the pack of Nasi Lemak. Brinchang Square has the best barbeque fish restaurant which is callsed Nik Ikan Bakar. Craving for light snack in Cameron? Look no further because the light and soft scones served with a cup of English tea will make your day. The perfectly baked scones served here come with Devonshire cream. Other than that, strawberry crepe that comes together with plenty of strawberries and a good combination of crepe is also highly recommended for all. There are quite a lot of places where you can enjoy cup of fresh highlands tea of coffee while savouring the sumptuous cakes and other pastries. At most cafes in Cameron Highlands, you will come across a wide range of different cakes baked to perfection to be taken with a hot drink. My Cake Home – This is a popular hangout among the locals and visitors. Located in Tanah Rata, My Cake Home offers a cosy and homely environment if you like this type of ambience. Here, you can order all types of unique cakes and other items. A must-try item here is the cheese lemon cake which is highly rated by those who have enjoyed it previously. Warong Kek Cameron Cakehouse – Another place where you can enjoy cakes and such is at Warong Kek Cameron Cakehouse. This outlet is located in Brinchang. Housed in a convenient spot with bright signboards, you will like the place where you will surely find a slice of cake you like among the spread. Their cheese cake is one of the most famous here while you can buy custom-made cakes for any other occasions if required. Hawker food is very popular if you are visiting Malaysia and more so at Cameron Highlands as you can find them almost at every corner of the major towns like Brinchang and Tanah Rata. When it comes hawker food, you actually get to try out some of the local delights without having to pay exorbitant prices because of their simple setting and usually non-air-conditioning outlets. After all, you get to enjoy the ‘natural air-conditioning’ when eating outdoors here in Cameron Highlands. Hawker food is available usually throughout the day in Cameron Highlands. You can spot them through their widespread tables and chairs which are placed in front of the string of stalls. This is most evident at the Bus Station in Brinchang town. You will notice that these stalls practically come alive during the night and is the perfect place for supper. The stalls usually close around 1.00am in the morning and you can find a wide variety of Malay, Chinese and Indian foods. You should try out the cooked dishes like Nasi Padprik, Mee goring or if you want to heat up your body, try the Sup Ekor. Otherwise, local favourites like Nasi Goreng and Chicken Rice are available as well. The infamous Night Market in Cameron Highlands remains as one of the top attractions among both local and foreign visitor here. If you are familiar with the Pasar Malam concept round Malaysia, you will know that this is the place to go for food, snacks, products and everything else you can think of. In Cameron Highlands in particular, the Pasar Malam is full of surprises with some of the best foods around. Located in Brinchang, the KFC outlet here offers a great place to dine if you are looking for something quick and delicious, particularly the unique and original fried chicken which KFC is known for across the world. Take note that the KFC outlet here is usually very crowded as a lot of locals and visitors prefer it for it convenience. While the taste and the recipe is consistent, the freshness of the food is one that could be improved. This is because being in the highland, some of its foods are sourced from the nearest towns and cities which could be frozen for several days. Like every other fast food chain, Marrybrown is a popular outlet here in Cameron Highlands. Its branch is located in Tanah Rata which is not far from Brinchang town. Compared to KFC, Marrybrown’s fried chicken is more famous among the locals as it has a distinctive ‘local flavour’ to it. Besides that, Marrybrown is homegrown and has a variety of traditional dishes as well. Its western choices meanwhile are quite popular among urban visitors and foreigners. However, it must be noted that freshness of the foods provided can be doubtful as they are usually frozen before they are cooked and served to the customers. 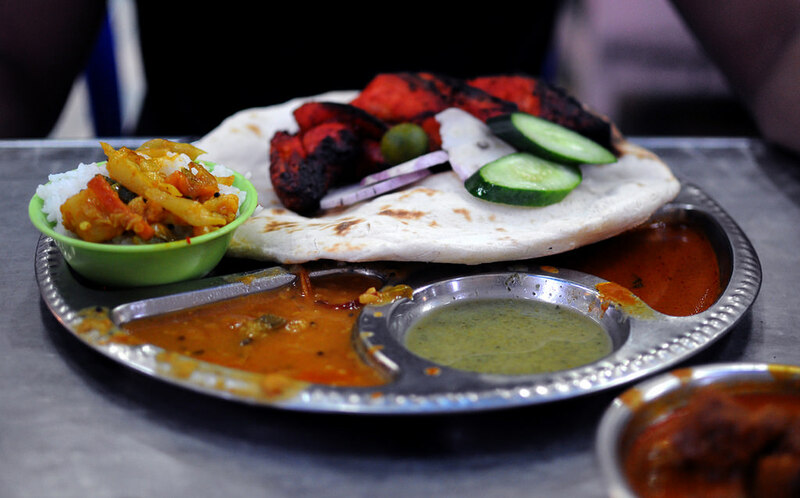 Western food can be found at almost every restaurant, café and coffee house outlets around Cameron Highlands. Besides the local cuisine, if you are one who likes steak, lamb chop, scones, fish and chips, grill fish, mash potatoes and salad, you will be spoilt for choice when it comes to western food. There are abundant of cafes serving western cuisines around Cameron Highlands particularly in Tanah Rata. J Tea Café is worth visiting for they serve a variety of local and Western cuisines. If you happen to explore Brinchang town on foot, it is located right beside Brinchang Hotel and Parkland Express. Other than a fine mixture of Western cuisines such as black pepper steak and European style chicken chop, diners will be spoilt for choice when it comes to beverages since the restaurant has liquor license thus there are a variety of cocktails in the menu. The reason why you find that there are quite a lot of steaks, chops and chips is due to the strong English influence here dating back to many decades of history when the English discovered Cameron to become a hill station. As the top manufacturer of tea leaves, you can rest assure that you will taste the best English Tea usually taken with bread, pastries and other snacks which are freshly produced, packed and served. Meanwhile, you will be able to enjoy the original continental sauce and recipe used to prepare the likes of pork chops, scallops and many more.